Sternocleidomastoid is a vital muscle of the neck that spreads out obliquely throughout the side of the neck, splitting it into posterior and anterior triangles. Sternal head is tendinous and emerges by a rounded tendon via the superolateral part of the front of the manubrium sterni, under the suprasternal notch and in front of the sternoclavicular joint it travels superiorly, posteriorly as well as laterally. Clavicular head is flat as well as musculoaponeurotic. It travels vertically upwards, deep towards the sternal head along with whom it unifies to create a fusiform belly. It emerges via the medial third of the superior surface of the clavicle. A small triangular gap exists in between the two heads above the sternoclavicular joint. It is referred to as lesser supraclavicular fossa. It passes via behind the ear towards the pit of the neck, and stands apart prominently in action. The sternal head can be seen via origin towards insertion; the clavicular head is generally noticeable on the lower half of the neck that is the upper half of the clavicular head mixes into the prominent sternal head. The single belly includes two heads, which when strained can be seen separating into the thicker, more visible, fusiform sternal head and the larger, flattened, strap-like clavicular or “cleido” head. A thick tendon on the lateral surface of the mastoid process extending via its tip to its base. Through a thin aponeurosis into the lateral half of the superior nuchal line of the occipital bone. Upper part through occipital and posterior auricular arteries. Middle part through superior thyroid artery. Lower part through suprascapular artery. The sternocleidomastoid muscle is supplied by the spinal accessory nerve. It is likewise supplied by the ventral rami of C2 and C3, which are mainly sensory and bring proprioceptive sensations via the muscle. When muscle agreements, it inclines the head to the shoulder on the similar side and turns the head so that chin relies on the opposite side. 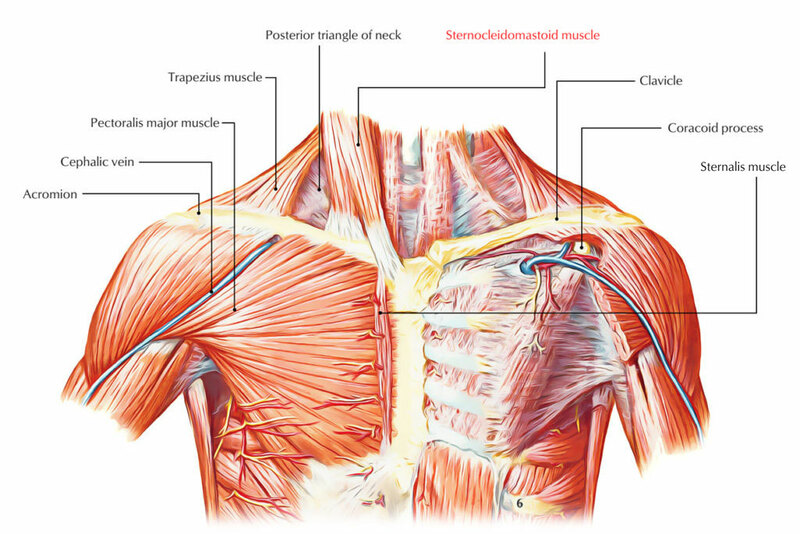 If the head is fixed by prevertebral muscles, the two sternocleidomastoid muscles serve as accessory muscles of respiration throughout required inspiration. This movement happens throughout an upward sideways look. When muscles of both sides agreement together they draw the head forwards as in raising the head via the pillow or flexing the head throughout consuming food. The sternocleidomastoid is confined in the investing layer of deep cervical fascia. It is pierced by the spinal accessory nerve and 4 sternomastoid arteries. Its superficial and deep relations are as under. Muscle: Posterior belly of digastric, longissimus capitis, and splenius capitis. Muscles: Levator scapulae, scalenus anterior, scalenus medius, scalenus posterior, splenius capitis, inferior belly of omohyoid. Arteries: Common carotid, internal carotid. Veins: Internal jugular, anterior jugular. Nerves: Vagus, spinal accessory, cervical plexus, brachial plexus (upper part), ansa cervicalis (inferior root). Glands: Thyroid gland, lymph nodes. Muscles: Sternohyoid, sternothyroid, scalenus anterior. Nerves: Brachial plexus (lower part), phrenic nerve. It is a clinical condition where head is bent to one side and chin pointed to the other side. This happens due to convulsion of sternocleidomastoid and trapezius muscles supplied by spinal accessory nerve. The spasmodic torticollis is identified by duplicated painful contractions of the trapezius and sternocleidomastoid muscles on one side. It is generally triggered by direct exposure to cold and maladjustment of pillow at the time of sleeping. The reflex torticollis happens due to inflammation of spinal accessory nerve triggered by inflamed or suppurating lymph nodes. The congenital torticollis happens due to birth injury to muscle. Permanent torticollis might happen due to subsequent ischemic contracture. It is the swelling in the center third of the sternocleidomastoid muscle due to edema and ischemic necrosis triggered by birth trauma.